Linen halter dress. Full skirt, drapes below the knee. Back zip closure, ties at back. Available in 24 colors. Fabric is Chiffon. A simple silhouette gets a modern update for a look that is ultra feminine. * Flowing chiffon cascades from the waist to shape loose, romantic layers. 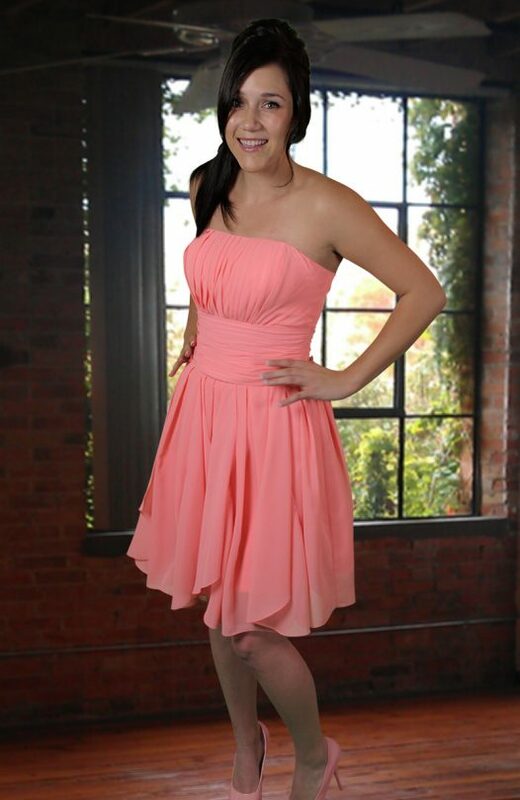 * Pleated bodice adds dimension and flatters all figures. * Soft chiffon moves with the body to create a mesmerizing overall look. This short dress will make an entrance at any event. Designed in a comfortably flowing chiffon fabric, the ruched bust and front detail will flatter every figure: * Twist-front bust is flattering and unique. * Empire waist creates an elongated silhouette. * Fully Lined. Back Zip. Trendy and chic with zig-zag ruching and a floral design along shoulder, what’s not to love about this dress! * One-Shoulder a-line features floral detailing on the shoulder. * Zig-zag ruching on bustline adds that extra special something. * Fully Lined. Back Zip. 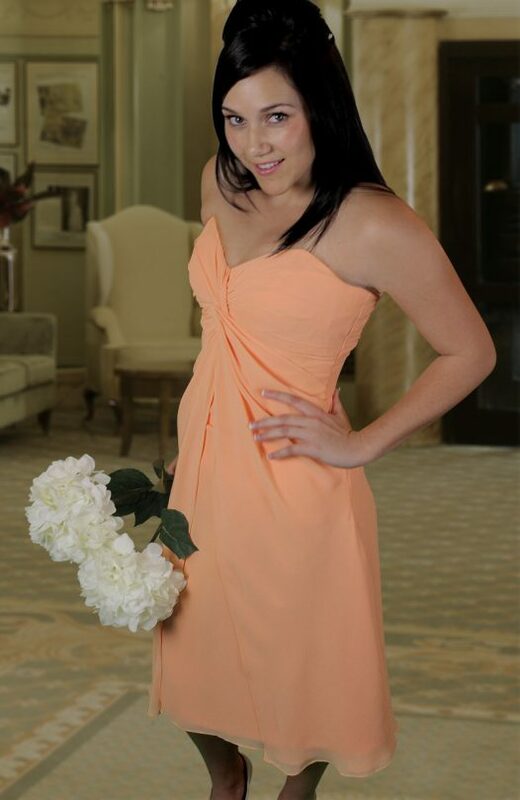 Fitted bodice dress with V neck and empire waist. Straight skirt falls to knee, but skirt length is customizable. Available in 24 colors. Click on the “size chart” icon below to view our sizing and measurement instructions. 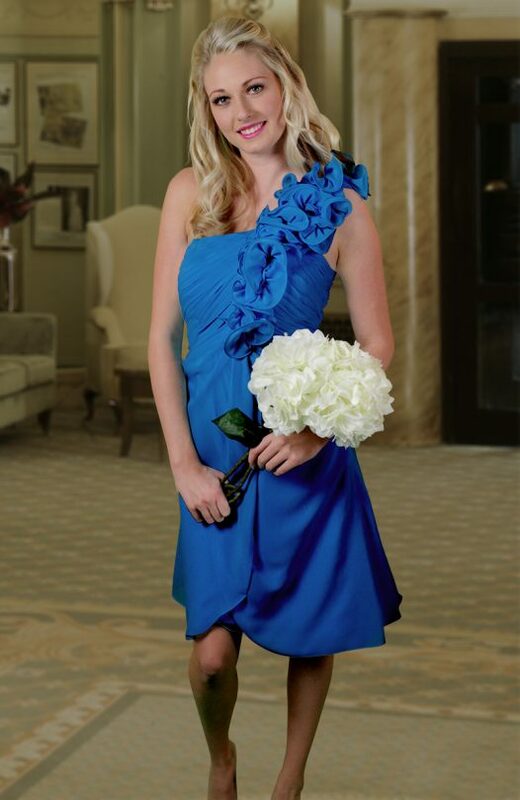 All of our Wedding and Bridesmaid dresses are custom made and delivered within 4-6 weeks. “A great shirt for a great wedding!